The Halo Effect is a cognitive bias that causes our evaluation of people, concepts, or objects to be influenced by our perceptions of one attribute of those people, concepts, or objects. It can lead us to make significant errors of judgment. 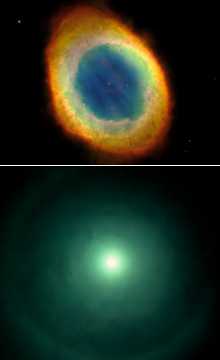 Two halos: the Ring Nebula (top) and a solar halo (bottom). The Ring Nebula (Messier 57) is a shell of ionized gas that surrounds a white dwarf star following an explosion of a red giant star. The shell is actually spherical, but it appears to us to be a ring because from this angle its edges are thickest. The solar halo is a fairly common sight that occurs when high thin clouds are positioned between the sun and the viewer. The clouds consist of tiny ice crystals oriented randomly, and rotating and moving randomly, but a tiny fraction of them at any one time are oriented just right to reflect and refract solar light at an angle of about 22 degrees. Thus the angle between the line to the sun and the edge of the halo is exactly that angle. These two halos are of fundamentally different kinds. The atoms of the Ring Nebula actually emit light. The ice crystals of the high thin clouds that produce the solar halo are reflecting and refracting light, the source of which is elsewhere (in this case, the sun). The Ring Nebula is an active halo, the solar halo is a passive halo. The ionized gases of the Ring Nebula are primary sources of light. The ice crystals of the solar halo are secondary sources of light. In the Halo Effect, the halo in question is passive. That is, when evaluating people, ideas, or objects, there are two kinds of attributes in question. The attributes we know and understand are the primary sources. The other attributes — the ones we get confused about — are the secondary sources. Photos of the Ring Nebula and the solar halo courtesy U.S. National Aeronautics and Space Administration. Cognitive biases are psychological phenomena that distort our perceptions, memory, or judgment. When success depends on accurate perception, evaluation, or recollection of what's around us, distortions can lead to erroneous results that range from harmless to catastrophic. The Halo Effect (or Halo Error) was first identified in 1920 by Edward Thorndike, who was studying how military officers evaluated their subordinates [Thorndike 1920]. He found that high (low) ratings in one attribute tended to be correlated with high (low) ratings in other seemingly unrelated attributes. But the effect is universal, extending beyond military performance evaluation. In modern experiments, for example, researchers have demonstrated that people tend to judge physically attractive people as possessing more socially desirable personality traits than do less physically attractive people. Thus physical traits bias our assessment of personality traits. In the context of performance reviews, researchers have demonstrated that when evaluators perceive in subordinates attributes that they regard as negative, those evaluators tend to assess more negatively the unrelated attributes of those subordinates. The Halo Effect is pervasive. Here are three examples of how it can affect organizational decision-making. Assessments of the validity of someone's assertions can be affected by our perception of her or his status. For instance, when supervisors attend meetings of their subordinates, their statements tend to have greater weight than they deserve. And when pariahs speak, listeners are more likely to discount what is said than when superstars deliver essentially the same message. The effects of status are wide-ranging. For instance, someone mentored by a high-status individual can acquire some of the elevated status of the mentor. See "Dispersed Teams and Latent Communications," Point Lookout for September 3, 2003, for more. When we assess the truth of an assertion, we examine the argument that justifies it. In the course of that examination, if we find a flaw in the argument, we sometimes conclude that the assertion is false. The assertion might indeed be false, but finding a flaw in a supposed proof of the assertion doesn't prove that the assertion is false. This error is a rhetorical fallacy known as argumentum ad logicam, the fallacy fallacy, or the fallacist's fallacy. It's a manifestation of the halo effect in the realm of logic. essentially the same messageThe name evokes the idea that we hang the hat of someone from our past on someone in our present. For example, life can be difficult for someone whose appearance matches the appearance of a film actor who often plays villains. It's a manifestation of the halo effect in the realm of personal identification. Hat hanging can occur in supervisor-subordinate pairs when age differences approximate parent-child age differences. See "You Remind Me of Helen Hunt," Point Lookout for June 6, 2001, for more. Would you like to see your comments posted here? rbrenjkgtZDbXcwmHmdDSner@ChacgApJyLFLGbSIUzDhoCanyon.comSend me your comments by email, or by Web form. I offer email and telephone coaching at both corporate and individual rates. Contact Rick for details at rbrenrCliQFhUJUAuXfxlner@ChacoJeXiGlucxdqPSdEoCanyon.com or (650) 787-6475, or toll-free in the continental US at (866) 378-5470.